The best virtual desktop managers for Windows | ComTek Computer Services Inc. Virtual desktops, also called workspaces in some contexts, expand the visual interface of the system usually in the form of copies of the desktop environment but sometimes also by allowing users to scroll on the desktop. The first platform graced with a virtual desktop managers was Commodore's Amiga 1000 back in 1985. Today, it is natively implement in most Unix-based operating systems and available in form of third-party programs for other operating systems such as Windows. Microsoft's first implementation of virtual desktops on Windows came in form of its Powertoys tools collection for Windows XP which shipped with options to use up to four desktop interfaces on the system. Virtual desktops offer several benefits over single-screen systems. Without doubt the most compelling reason to use them is that program windows can be separated into groups on different desktops. This can be done to streamline work processes but also to avoid having to minimize and display windows regularly on the screen due to space constraints. You could separate entertainment, work, development or messaging programs by assigning them to a specific virtual desktop for example. Users may benefit from virtual desktops in other ways. 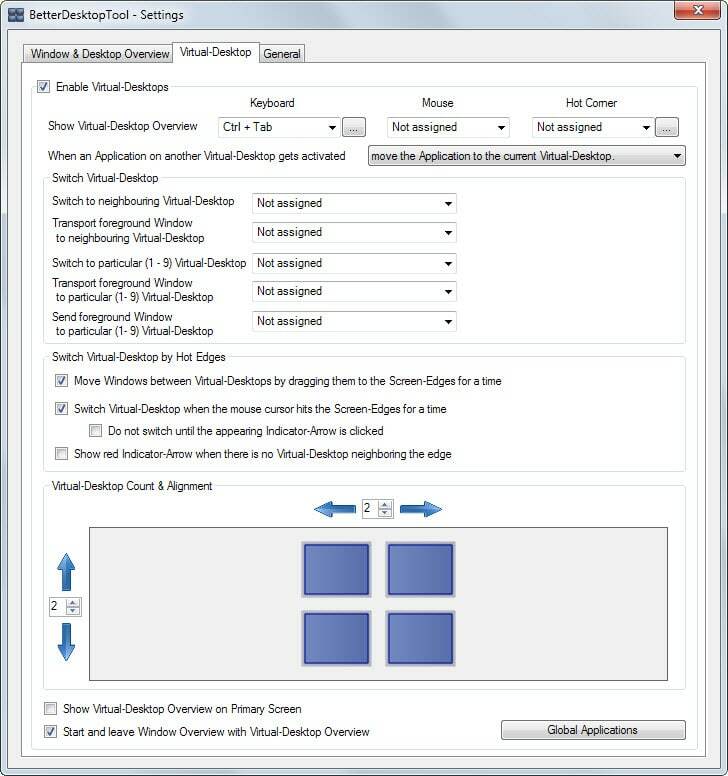 Applications can be hidden by launching them on a virtual desktop, and it is possible to set a different wallpaper for each to change the environment visually as well. All virtual desktop programs tested by us had to meet the following requirements to be included in the list below. Support for all recent versions of the Windows operating system (32-bit and 64-bit). A free version must be provided. The first part of the list offers a short overview of each program and functionality that it provides. You find a table at the end listing core information that may help you find the right software and recommendations based on our own experience and use cases. The free program needs to be installed before it can be used. It provides you with up to eight additional desktop environments that you can switch between using hotkeys or the program's system tray icon. What sets it apart from other applications of its kind is that you can password protect all virtual desktops. While it is still possible to switch to the environment, you are asked to enter a password before you can access the program windows on it. Apart from that, it supports the usual features that you expect from a virtual desktop application such as moving program windows between desktops. 9Desks supports rules that you can configure for individual programs so that they always launch in the selected environment. The virtual desktop program is free for personal use only. It can be used to create up to 64 desktop environments that you can switch between using hotkeys that you define in the interface or the program's system tray icon. You can display all desktop environments using the Ctrl-Tab key, mouse or hot corners. One interesting feature of the program is to set global applications which will become available in all environments. 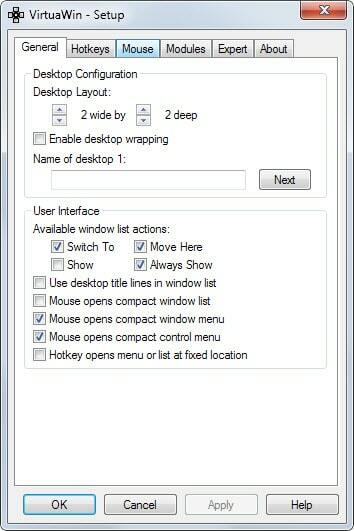 You can also use the window and desktop overview options for specific functionality such as accessing windows fast or moving all windows out of the way to access desktop shortcuts. Desktops is a lightweight portable program that adds three virtual desktops to Windows so that you control four desktop environments after running it. You can switch between those environments using the system tray icon or by using the hotkey Alt-[1-4] to do so. 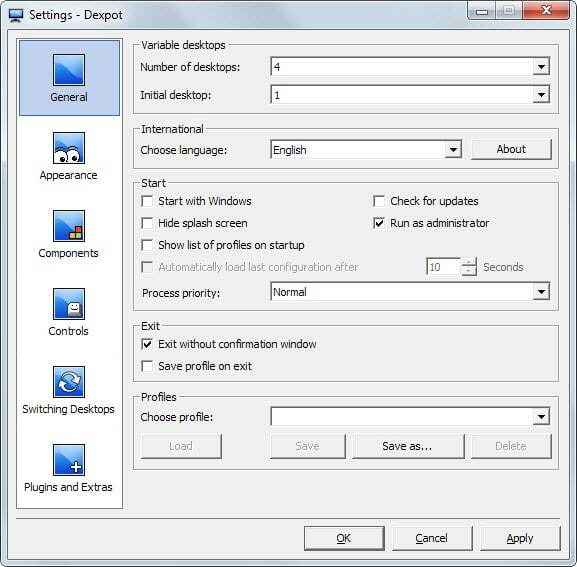 The preferences enable you to change the hotkey and configure the program to run on Windows start automatically. The program lacks options to move program windows between desktops, and since it is relying on Windows Desktop Objects, will not display all open program windows on the taskbar. There is also no option to close the program other than to kill the process directly. Dexpot can be run right after you have downloaded the portable version offered on the developers website. 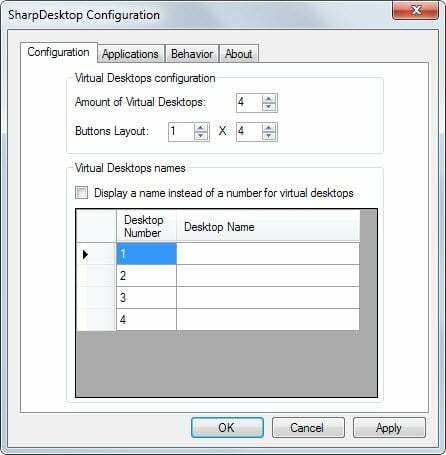 It creates three virtual desktops by default which you can increase to 19 in the program interface. Here you can also make dozens of modifications such as saving profiles, changing the appearance of program features and desktops, or modifying hotkeys and controls. 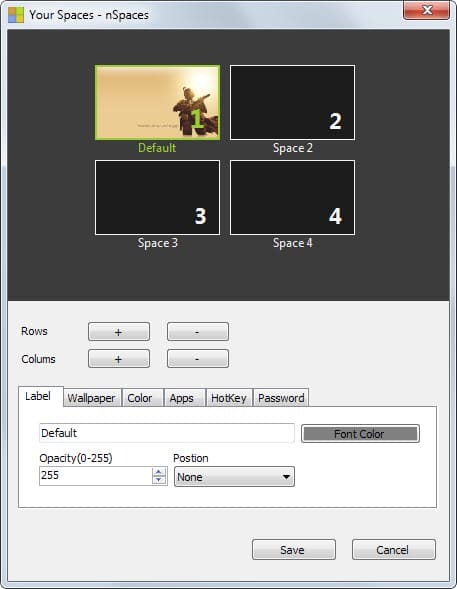 Windows can be moved between desktop environments and Dexpot's plugin system makes available extra features such as support for hot corners or dividing desktops into grids. 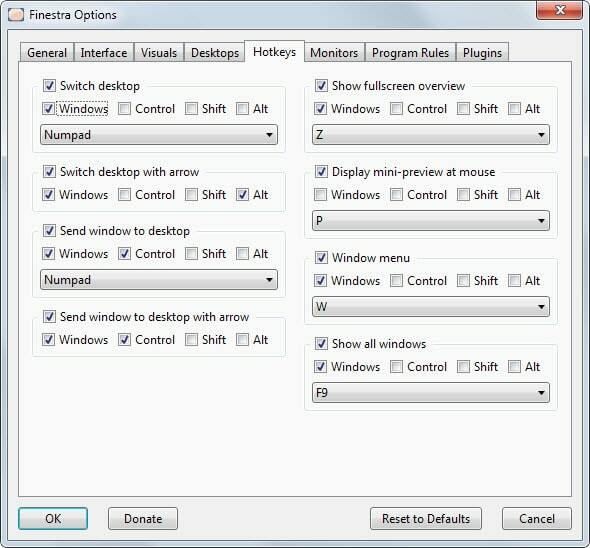 Finestra Desktops is a highly configurable program for Windows that you can use to create as many virtual desktop environments as you require. It supports the usual features such as hotkey switching and appearance changes but also several features that most programs of its kind don't offer. This includes support for multi-monitor systems, rules to launch programs always on the selected desktop, as well as plugin support. The free program provides you with access to three virtual desktops on start after installation. 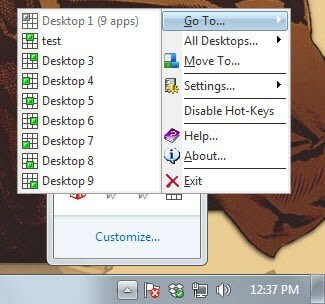 You can switch between desktops using the small window displaying them, the system tray icon, or by using hotkeys to do so. 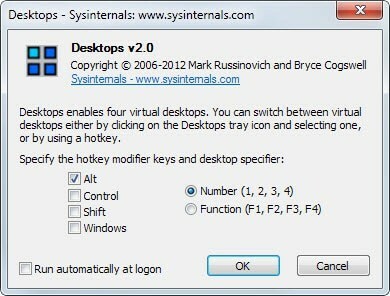 You can change the hotkeys using the system tray icon and set different wallpapers for each virtual desktop. The only other options provided are to switch skins and languages, and to start the program on boot. The program does not seem to have any limitations in regards to how many desktops you can create using it. Each desktop can be configured individually in the interface. This includes specific hotkeys, wallpapers and password to protect against unauthorized access. 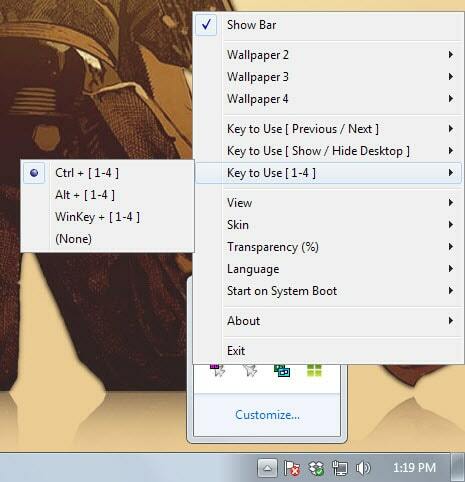 You can switch between desktops using hotkeys or the system tray menu. The application requires the Microsoft .NET Framework 3.5 or later and needs to be installed. SharpDesktop displays a small desktop switcher window on the desktop on start. You can use it to switch between windows, or use the program's system tray icon to do so instead. The program does not support as many features as other programs of its kind, but if you require lots of virtual desktops, its 100 desktop limit may make it interesting to you. The free program has not been updated since 2005 but worked fine on our Windows 7 Pro 64-bit test system. 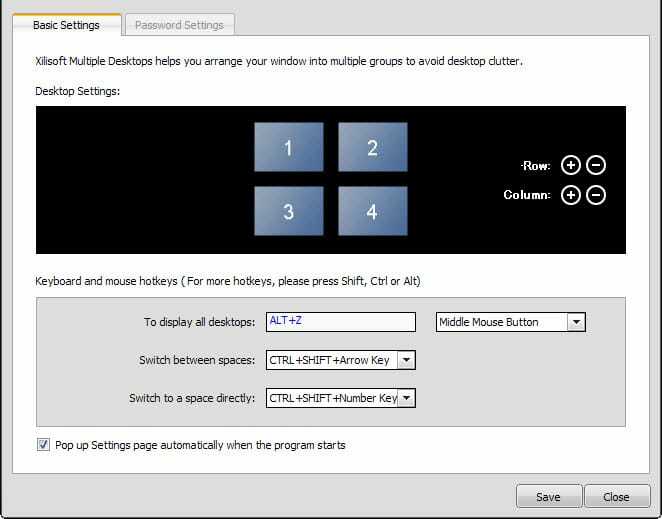 It provides you with options to create as many desktops as you require, options to set hotkeys and wallpapers for each desktop individually, an on-screen display for you to configure, as well as options to configure hotkeys for window and desktop switching operations. VirtuaWin is a sophisticated program that enables you to create up to 20 desktop environments. It is offered as a portable version and ships with lots of features that make it one of the most complete virtual desktop managers for the Windows operating systems. 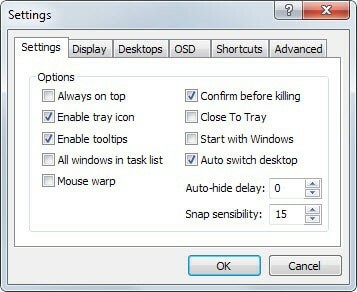 It supports all the usual features, such as using hotkeys to switch between environments, but excels when it comes to additional features such as using the mouse to move between desktops, moving program windows from one desktop to the other, or configuring automatic window behavior, so that specific program windows are always opened on the selected desktop. Especially the hotkeys that it makes available need to be mentioned here. There are so many options provided, for instance to move a window and follow it to the desktop it was moved to, that solutions for the majority of use cases are provided. You can run the program right after you have unpacked it on your system. Configuration is limited to editing an .ini file which you find in the program directory. Here you can change hotkeys or the number of desktop environments that you want to have at your disposal. All desktops are displayed in the taskbar so that you can switch between them with a single click. You can create up to eight virtual desktops using the program after installation. The desktop manager supports keyboard and mouse hotkeys to switch between environments, and options to password protect select desktops to protect them from unauthorized access. So which virtual desktop manager is right for you? If you are concerned about memory usage try VirtuaWin or Desktops. Both applications use a minimal amount of memory and provide you with a solid feature set that you can work with. Other programs make sense only if you require functionality they make available. If you want multi-monitor support, try Dexpot, and if you want password protection, check out 9Desks which offers that feature.